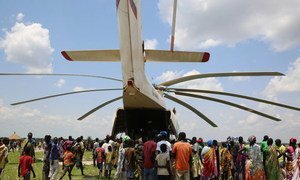 A World Food Programme (WFP) helicopter delivers much-needed supplies to people in Udier, South Sudan, 4 May 2018. The warning follows the release of a report on Friday, indicating that it is only large-scale humanitarian assistance being provided in many areas of the country, that has prevented even more devastating hunger during the July and August lean season. UNICEF and its partners, meanwhile, have admitted more than 147,000 children suffering from severe acute malnutrition into outpatient treatment programmes and stabilization centres. Mayen is South Sudanese. He was forced to flee his home when the conflict started in 2013. Five years later, his voice is resonating in one of the conference rooms of United Nations Headquarters in New York, on the margins of the 73rd General Assembly. 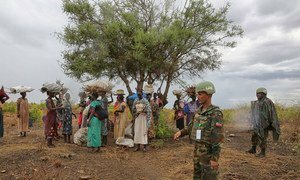 Warring parties in South Sudan must demonstrate their willingness to a peaceful end to their conflict by “making their guns fall silent. Immediately and everywhere,” said Nicholas Haysom, outgoing UN Special Envoy for Sudan and South Sudan, on Tuesday.